The countdown to Christmas is well and truly under way. What better way to proclaim the advent of the festive season than a pretty bunting that says just that – Christmas. Better still, a handcrafted bunting to herald the start of Christmas. Take that a step further, and the best bunting you could have this Christmas is one you make yourself, with a little help from the Christmas Bunting Kit from Sew& So On by docrafts. 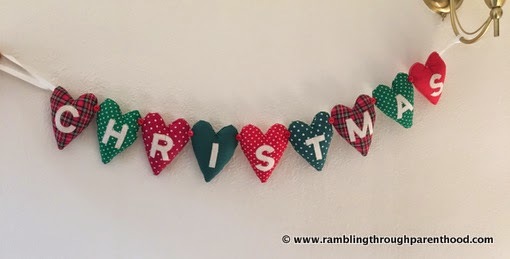 I had the opportunity to create my very own Christmas bunting with this kit. That I thoroughly relished the experience would be an understatement. There is something greatly satisfying about creating with your own hands. From threading the needle to aligning pieces of fabric to sewing that final stitch, the sense of achievement is incredible. 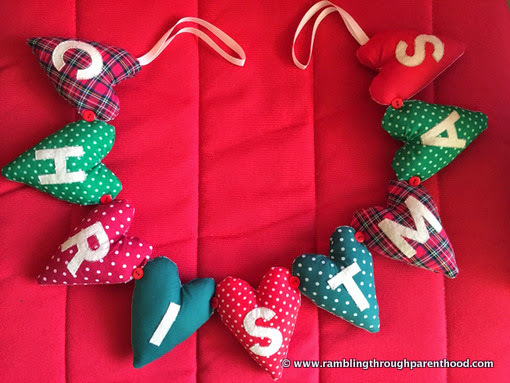 The Christmas Bunting Kit from docrafts makes it all quite easy indeed. So whether you are a crafting novice or a pro, you can get by very well with the help of this fantastic little kit. It contains all you will need to make your bunting, with everything cut to measure. You only need to source a needle and a pair of scissors and you are all set to create a fun festive decoration. 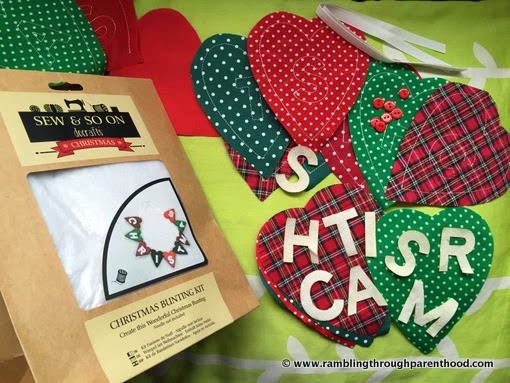 The kit spells out C-H-R-I-S-T-M-A-S in pretty fabric letters that have to be sewn on to green and red cloth hearts in a variety of patterns. There is tartan and polka dots and a couple of plain ones. The heart shapes are cut out and with pre-determined markings, making it extremely easy to orient, align and sew them together. I went through this project like an assembly line. 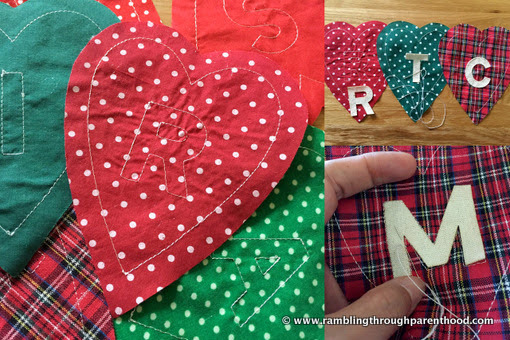 Starting with the letters, I stitched them onto the appropriate heart shapes. Next, I stitched each heart, inside-out, by following the markings on the cloth. The next step was the fun bit. I had to evert the shapes and stuff them with the fluffy filling, before sewing together each lettered heart to form the bunting. The red buttons to hide the joints made for lovely embellishment. 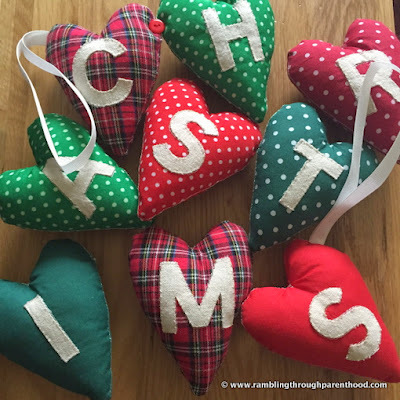 The end result is a dainty chain of hearts in patterns of red and green declaring ‘Christmas’. It is just the perfect decoration for any home. Or why not make it as a present for a special someone? Disclaimer: I was sent a Christmas Bunting kit by Sew & So On by docrafts for the purpose of this review. All opinions are my own. That looks gorgeous! I made some homemade heart decorations last year, they were easy enough even for a craft idiot like me and look so effective- tempted to give this a try as they look so pretty as a garland! Arn't you patient with all that sewing! It looks gorgeous. i'm sure you'll treasure it for years to come. Looks good. I think even I might be able to manage it! Hand made items are so lovely to receive as gifts too. That looks really effective and a lovely keepsake to remember in years to come! What a lovely craft - and so festive. Excellent job. This would be a little too hard for me, but I'm glad you loved the creation process. This seems a little too hard for me, but I'm glad you loved the creation process. I absolutely LOVE Christmas sewing kits! I've made quite a few Christmas tree skirts using the Bucilla kits, for family members. It is beautiful! I normally do not put bunting but if I had one like this I would sure do! I love bunting and this has to be the best - to be able to make it yourself, lovely and very festive. That's a really nice Christmas craft. I'm not sure I would be patient enough to do all that sewing though!